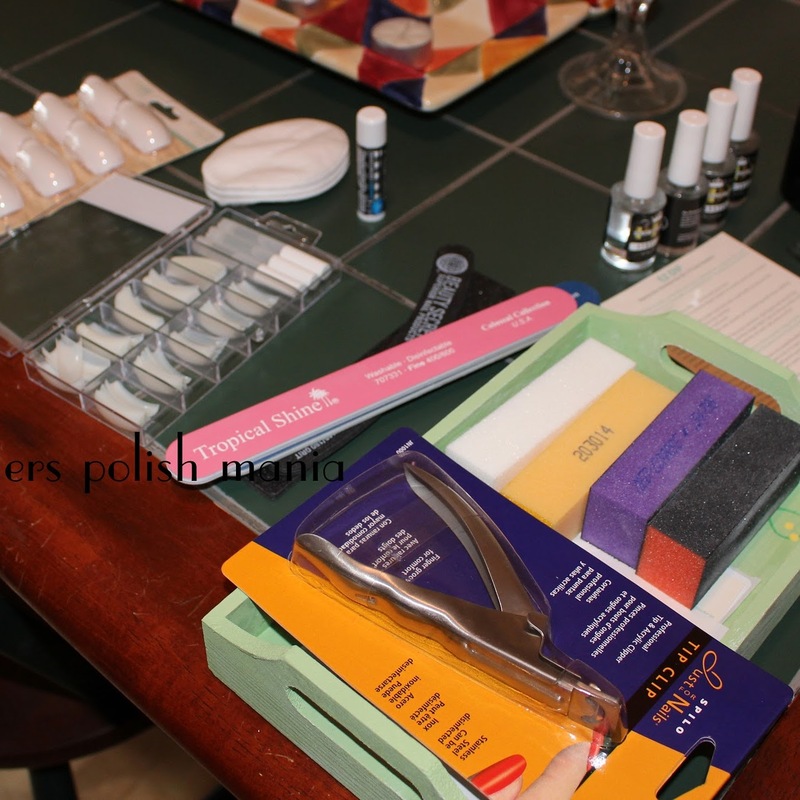 fingers polish mania: It's a Dupe Day Trilogy! It's a Dupe Day Trilogy! Before we get started, I wanted to say thank you so much for all my followers! I am officially up to 50 now. You know what that means right?!? Giveaway time! I will hopefully get my act together and have it up tomorrow- if not at least this week! I never thought in a million years that I'd even have this many followers! It means a lot to me! Thank you, thank you, thank you! Now on to the business at hand! This is part three of my famous Dupe Day posts. I love doing these, but my nails take a beating every time. The first comparison is between Chanel Steel and Essie Over the Top. I saw that someone had searched for this Essie and I thought they may be dupes. I do believe they are damn close. The Chanel may be slightly darker. Next up are my browns. The new Zoya Codie, Essie Little Brown Dress and OPI Suzi Loves Cowboys. 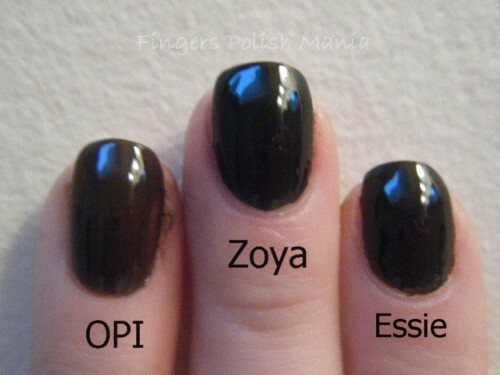 Now it's hard to see in these pictures because they are so dark, but the Zoya is a blackened brown and the OPI is a lighter shade of plain brown. The OPI doesn't match at all. 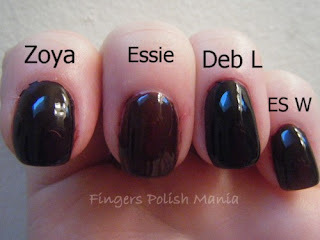 The Essie is similar, but doesn't have the black in it. Ignore the smear on the OPI-I smacked it taking these pictures. Lastly, we have the deep burgundy challenge. I did four colors for this one. 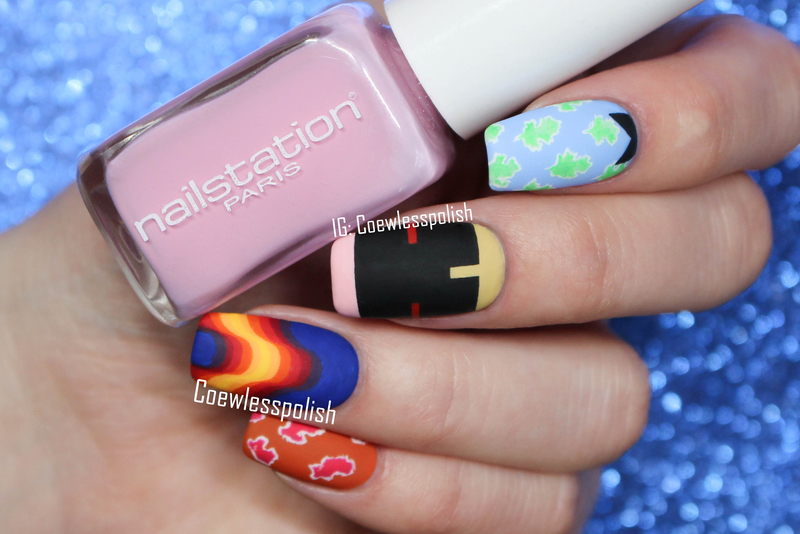 Zoya Anja, Essie Wicked, Essie Material Girl and Deborah Lippmann Dark Side of the Moon. 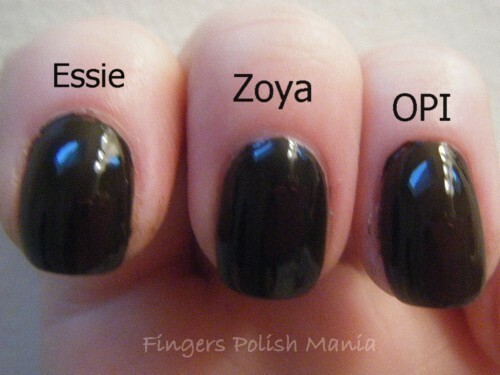 I think the Zoya and the DL are dupes. 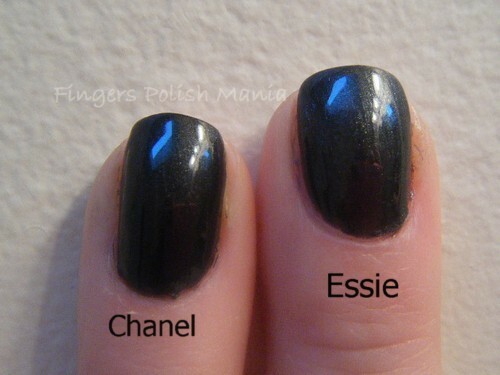 The Essies may be dupes between them, but are lighter. The Essie Wicked seems more like a jelly and the Zoya and DL are cremes. I hope you have enjoyed my trilogy of Dupe Days. I have more that I can do so let me know if you want me to keep going with these or not. And if you have any special requests. If I have them, I'll do them for you! Thank goodness I don't have that Chanel or I would feel awful right now lol. The Essie looks super close to me. I know some people are really nitpicky about "exact" dupes and whatnot, but it's definitely too similar for me. Yay! Money-saving! The reason I don't buy darker colors: They all looked pretty much black to me lol Great comparison though! 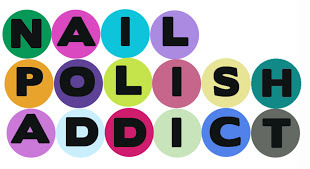 @thenailaholic-that what makes nail polish awesome-everyone has their own color taste! I live for dark colors! @Laura- Glad I could save you some dough! I love the bugundy colors!!! Thanks for another great dupe day! @P&C and KarenD- I'm glad you like them! I have many more in store! I like seeing comparison photos. 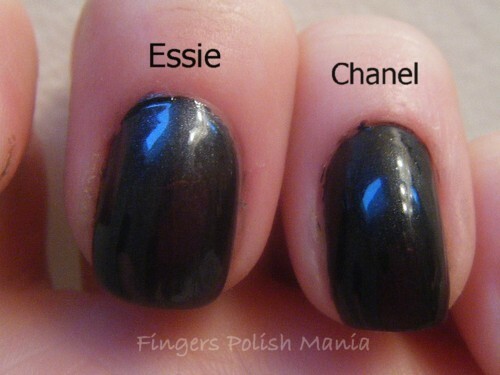 The Essie and Chanel look almost identical. I also love the dark colors...but I do watch them so they don't all turn black on me from a distance. I have to be able to see a shimmer, a duochrome, the blue, the purple, the green, the red/burgundy coming through the blackened base or I don't buy them. Funny too as I look horrible in plain black cream - any brand I have tried. @Beachgal- I agree. While I lice for dark colors, they can't just be black! 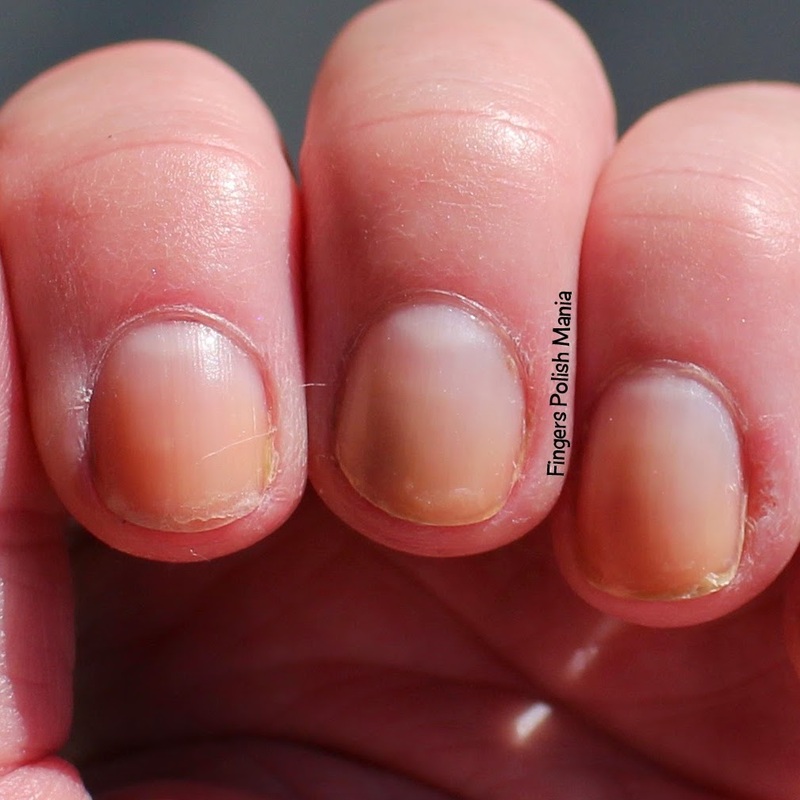 @I'm feeling nail venturous- they are just about identical! Glad you like these posts! Please, please leave me comments. I get so lonely without them! 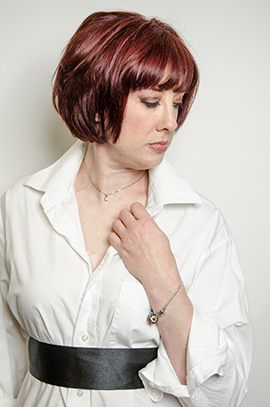 Don't make me keep talking to myself-and please don't leave links here- my blog, my rules! NexGen or EZ Dip Nails???? I can so be flashy! I've got deja vu-do you? Holy Hell I'm Dying Here! It's a disaster-I broke a nail!